To begin the third part of this article, we’ll look at some foundation charts to zero in on what these configurations may mean for the USA. The three charts examined with be the adoption of the Declaration of Independence around noon on 4 July 1776, George Washington’s initial inauguration as president under the U.S. Constitution on 30 April 1789 close to 1 p.m., and the 20 January 2013 inauguration signifying the current presidential term. We’ll compare them to what is going on in the sky on 20 April 2014 and begin our judgment from there. The Declaration of Independence adoption appears from historical records to have occurred late in the morning or very early in the afternoon. This gives a mid-Libra rising chart, which has been used to good effect for several years. This is rather striking, since the planets we’ve been talking about are all on the angles – with the Moon also joining Pluto on the IC later in the day. Since Mars is on the ascendant, one can expect danger to the physical body of the nation. A Hellenistic time lord technique called zodiacal releasing also plays a part in this delineation period (an explanation of zodiacal releasing and a practical exercise in its use may be found here: http://politicalastrologyblog.com/2012/04/29/prediction-for-the-2012-us-presidential-election/). The DoI chart shows zodiacal releasing from Fortune (body, health) to have both a Saturn Major and Minor and a level 4 loosing of the Bond 6 June 2014. Spirit zodiacal releasing shows Mars Major and Saturn minor beginning 18 Apr 2014 and a Level 4 loosing of the bond occurs 1 June 2014. Washington’s inauguration isn’t very well timed – other than he left the house he was staying in, walked to Federal Hall, was introduced to such members of Congress as were present, then inaugurated. 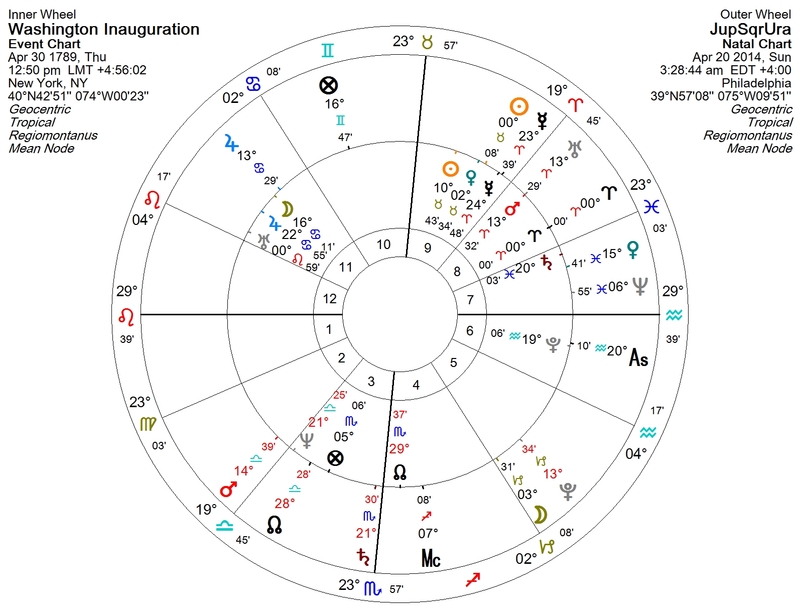 Most put the time shortly prior to 1 p.m.
Transiting Uranus is on the Mars of the Washington inauguration chart, transiting Jupiter is on the Moon, and of course transiting Mars and Pluto are making stressful aspects to those points. Mars in the Washington inauguration rules both the 4th House (home, buildings, etc.) and the 9th House (travel, foreigners, etc.). Zodiacal releasing Mars shows a Mars major period and Mars minor loosing of the bond 1 March 2014 (the same day Mars makes it retrograde station). Since the 20th Amendment to the U.S. Constitution was ratified in 1933, it is mandated that the previous presidential term ends at noon on 20 January every four years and the new term begins at that moment – no matter when the public swearing-in ceremony takes place. 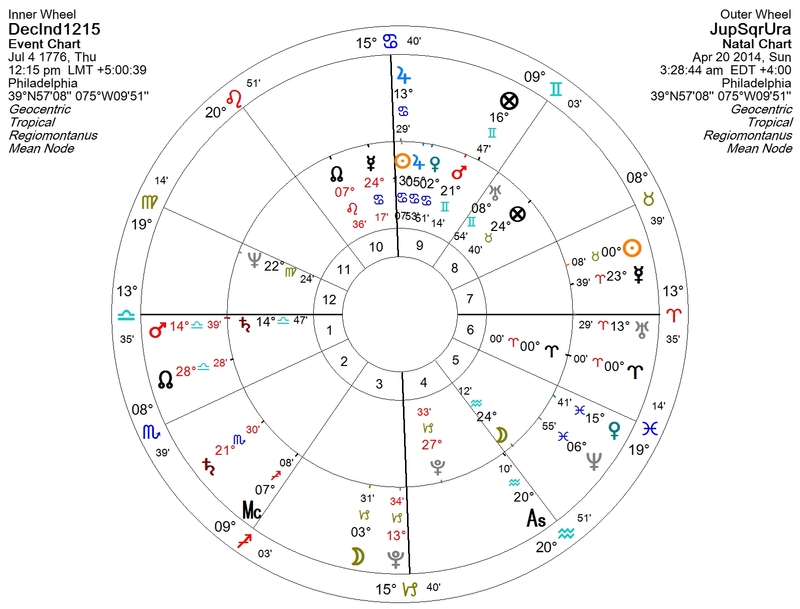 The most recent inauguration’s chart ruler is Venus in Capricorn, which is also being heavily stressed by the aforementioned factors. All these factors point to a large potential for violence in the spring and summer of 2014. But where and when will it take place? Where things may take place have been suggested by the first and second parts of this article. Some place to watch out for are Las Vegas, the U.S. Gulf Coast, Brazil, the Horn of Africa, the Middle East, and Indonesia – these areas are also reinforced by the Map for the 2013 inauguration. As far as the timing goes, things could happen when Mars makes contacts during the retrograde period, but think of Mars retrograde as reloading to get ready for action. Pay particular attention to after Mars stations direct on May 19 then aspects all those other points again while direct. Once Mars enters Scorpio and has extremely high Essential Dignity he will reconnect square to Jupiter on August 1. 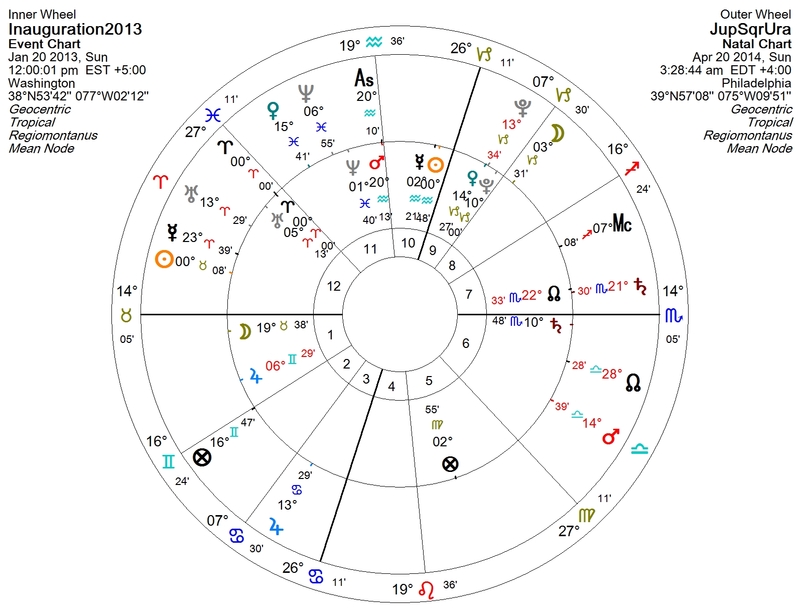 Mars goes from very disabled to very powerful on 25 July 2014. The reloading is complete, and Mars is ready to fire.